The bad news is that tooth decay is the number one most common childhood disease. The good news is that together, we can help parents prevent that! It starts at home, with early oral health care and a trip to visit our dentists before your child turns one. Now that your child has gotten to know us a little better and learned how to brush their teeth on their own, you need to provide the supplies, including toothpaste. There are so many choices out there and it can feel a little overwhelming so today we're going to look at some of the things you will want in toothpaste for your kids. When choosing the right toothpaste for your kids, the first step is talking to us. We will check for things like early signs of decay and make sure that all is well in your child's mouth as a first step. Next, look for the ADA seal. The American Dental Association approves only the best of the tested toothpastes before it will give its seal of approval. Checking for fluoride is also recommended by our office. Toothpaste that contains a small amount of fluoride helps keep teeth strong and aids in the prevention of bacteria and plaque buildup. This greatly reduced your child's risk for tooth decay. Find a toothpaste that's flavored for a child. While you may like the zing of cinnamon or the refreshing taste of mint, your child may not. 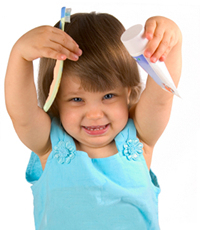 Finding a toothpaste that has a flavor like bubble gum can encourage your child to brush better. Be cautious that your child realizes that the toothpaste is not actually meant to be eaten, no matter how good it tastes. Kids who learn good oral health at an early age are less likely to develop dental cavities or worse problems like periodontal disease. Regular cleanings and checkups along with choosing the right toothpaste are all part of good oral health. We look forward to seeing you and your child soon!